A non-casino hotel on the Strip that"Does Vegas Differently." So do I... I love it! Up to 40$ Off Golf! 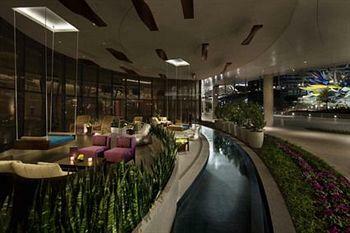 Book a two-night (or more) stay at Vdara in Las Vegas and receive up to 40% off at three Walters Golf Courses. Click on the green 'Use Promo' button to the right... Locate and click on the 'Offers' tab... Find the desired promotion and book your stay! The suites at Vdara Hotel and Spa at CityCenter Las Vegas are super-swank! Starting at 582 square feet, these suites actually have style and sophistication. You won't find orange shag carpet and fishy shower curtains at this place (total bummer). The suites have everything you need to feel at home well, not our home - more like your rich uncle's home. They've got beds with pillow-top mattresses, living rooms with flat screen TVs, wireless Internet, dining tables, stainless steel kitchen appliances, full-size fridges, stoves, and microwaves, you know, for if you want to cook instead of enjoying delicious Sin City restaurants. The bathrooms at Vdara Hotel and Spa at CityCenter Las Vegas have a separate shower and soaking tub, and all the bath goodies are Aveda. You have no excuse for hitting the Vegas Strip in dirty clothes (unless it's an awesome style choice), each room comes with it's own washer and dryer. 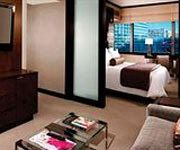 Also check out the Vdara Las Vegas Promo Codes for special packages that make these rooms a great value. We still can't afford it but if we could, the ladies would be flocking. The service at Vdara Hotel and Spa Las Vegas is pretty good. Everyone is nice but check-in is a super slow process and it's obviously not designed for groups. Our room has a pull-out sofa bed but eh, who needs it? One king bed for four guys is actually quite lovely. 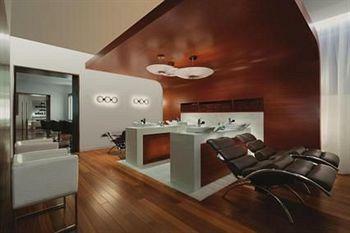 Vdara Hotel and Spa at City Center Las Vegas decks visitors out with Aveda. Mmmm smells so good you could eat it. On that note, the conditioner makes you sick when swallowed. 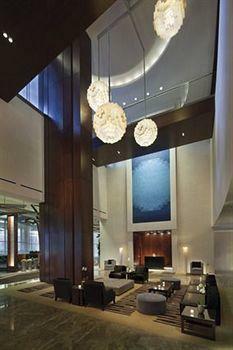 Vdara Hotel and Spa at CityCenter Las Vegas is full of classy non-smokers. Cool if you're into that sort of thing. Cough. Cough. The pool at Vdara Hotel and Spa at CityCenter Las Vegas is on the small side but there are a few little "pool plunges" as they call them. Luckily we were able to scrounge a few cocktails and test out our keen belly-flop skills before security kicked us out. 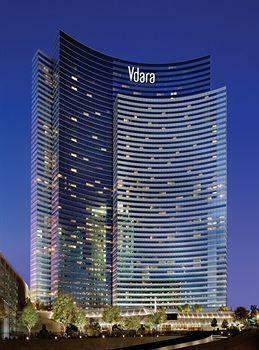 The Vdara Las Vegas CityCenter Resort has a fee of $28 per night. This includes internet service in the room and public areas, unlimited local and toll free calls, daily newspaper pickup, two bottles of water per day, access to the fitness facility, boarding pass printing service and nightly turn-down service upon request. Let's hope we at least get a chocolate on the pillow! If you don't care about poaching the Aria casino every night, then yeah, it's worth it. Like many bars, Bar Vdara Las Vegas is a destination for drinking, but to prevent the drunkies leaving unhappy of course they have a bit of a menu too. And by bit, we mean the menu is small. Very small. But just because there isn't much on the menu doesn't mean they aren't willing to charge you a lot for all of it! The cocktails run about $14 a piece, and the food goes up from that price. If you're in need of a coffee, a snack, and something sweet, the Market Cafe Vdara Las Vegas is open from the early morning to the later hours of the evening every day! They've got a full breakfast and lunch menu in addition to all of their teas, coffees and market selections. Maybe go for a full meal somewhere else though, the prices here aren't the most Cheapo-friendly. 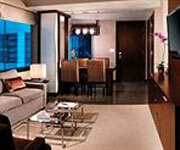 The City Corner Suite at Vdara Las Vegas CityCenter Resort is pretty cool, you know, if you're into super posh designs. Psh. Walk in and see a partial view of the Bellagio fountains, Vegas mountains, or CityCenter out your window. A super classy modern motif makes you feel like you're cool by just staying here, or peering into one of the windows through binoculars (creepy peeper). These 800 square foot suites are available with one king bed, pillow top mattresses, wireless Internet, living rooms with 42-inch plasma HDTVs, and queen sleeper-beds. The kitchens have stainless steel appliances including a stove, fridge, and microwave. The bathrooms have separate soaking tubs and showers and Aveda toiletries. Keep in mind these suites are non-smoking and have an in-room washer and dryer if you discover a hole in your lip while drinking your favorite red vino. If this suite is the "basic" option at Vdara Hotel and Spa at CityCenter Las Vegas, wonder what they would call our sad excuse for an apartment. The Deluxe Suite is 582 square feet of total luxury. It comes with a kitchenette if you need to re-heat last nights 4am Denny's run and a king bed with a pillow-top Sealy mattress. It also has a media-hub for all your gadgets, electric cook top, dining table, and spa-style tub. Yes please! Pass the bubble-bath. Keep in mind this is a non-smoking room. It's official, this room is AMAZING! We damn near fell over when we saw the view. 270-degree panoramic views of the city basically make you 100 times cooler while staying in this suite. It doesn't hurt that the design is super modern and classy either. The Panoramic Suite has all the typical amenities of a Vdara Hotel and Spa Las Vegas suite: king bed with pillow-top mattress, free Internet, spa-style tub, kitchen with stove, fridge, microwave and separate living area with a media hub for all of your techy gadgets. 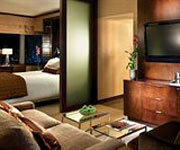 This is a non-smoking room and the ultimate place to stay when it comes to Las Vegas luxury. You are a baller if you are staying in one of these suites! 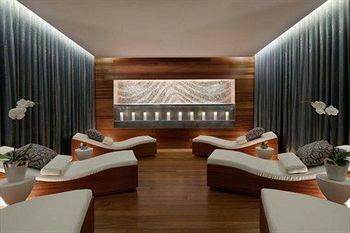 The Vdara Hotel and Spa Las Vegas has two-story suites on the top floors with insane panoramic views of CityCenter Las Vegas. Complete with complimentary limo service to and from the airport (yeah, you're THAT cool), guest powder room, washer/dryer, stainless steel kitchen appliances, custom glass and wood dinning table for four, living room with pull-out queen sleeper, media hub, and 42-inch HDTV, this room is enough to make you never want to leave. Why would you venture into the real world when you can sit around your room and feel like a rock-star? The Penthouse also comes with a spa facilities pass so you can pamper your tushie all day long. This is a non-smoking room.